this article may be of interest to any artist who regularly needs to make use of professional respirators; it contains more detailed information on respirator use than is commonly available. Note: This appendix does not discuss respirators for rescues, atmospheres immediately dangerous to life or health or other emergencies. If such conditions potentially exist at your facility, further information may be found in the References at the end of this appendix. Respirators are a poor substitute for controlling or preventing exposures with engineering controls, process change, chemical substitution or other methods. But respirators are required under certain circumstances: When effective engineering controls are not present or not feasible or cannot adequately protect employees; While engineering controls are being installed; Employers who attempt to save money by using respirators instead of exposure controls are engaging in a false economy. Proper respirators correctly used and maintained entail a large expense; improper use exacts a cost to workers' health and to employers by increasing the likelihood of lost time, ill workers and liability. To be effective, all aspects of a respirator program must be carried out; if any one phase is deficient the protection of respirators may be drastically reduced. A respirator may even increase a health hazard by providing a false sense of security to employees who may then remain for longer periods of time in contaminated areas. A single individual should be designated to develop and manage the respirator program. Without a definite chain of supervision, there is no assurance that written procedures will be followed. The individual designated should develop a written standard operating procedure covering the following program areas: a. The basis for selection of a specific type of respiratory protective equipment. b. Provision for medical screening of each employee assigned to wear respiratory equipment to determine if he/she is physically and psychologically able to wear a respirator. c. Provisions for testing for the proper fit of the respiratory protective equipment. d. Provisions for regularly cleaning and disinfecting the respiratory protective equipment. e. Provisions for proper storage of respiratory protective equipment. f. Provisions for periodic inspection and repair of respiratory protective equipment. g. A periodic evaluation by the administrator of the program to assure its continued functioning and effectiveness. h.
An employee training program in which the employee can become familiar with the respiratory protective equipment and be trained in the proper use and the limitations of the equipment. The manager of the respirator program should ensure that all phases are implemented initially and carry out periodic review and evaluation to ensure their continuing quality. The proper selection of respiratory equipment involves two basic steps: a) the identification and evaluation of the hazard, b) selection of the appropriate approved respiratory equipment based on this information. a. Hazard Identification and Evaluation A walk-through survey of the plant to identify employee groups, processes or worker environments where the use of respiratory protective equipment may be required, is the first step in the respirator selection process. The walk-through survey to identify and quantify the hazardous substances or conditions that require respiratory protective equipment can be facilitated by use of the Hazard Evaluation Form (see Figure 1). In addition, it may be necessary to conduct industrial hygiene monitoring for toxic chemicals, because their airborne concentration is an important factor determining what respirators are needed. A document entitled Appendix A: Industrial Hygiene Monitoring is available from the NJ Department of Health. b. Respirator Selection The contaminant concentration is a factor in determining the appropriate respirator. For example, OSHA spells out respirator requirements in the lead standard based on concentration (see Figure 2). Other selection factors and the available types and approximate prices of respirators are explained in Appendix C: Respirator Selection, available from the New Jersey Department of Health. 4. Medical Screening All respirators impose some physical stress on the user. Air purifying respirators, for example, make breathing more difficult by impeding the flow of air. The OSHA Respiratory Protection Standard (1910.134) requires that a physician determines an employee's fitness to wear a respirator. The decision must be reviewed periodically, after prolonged medical absences from work or whenever a functional disability has been identified. The following checklist should be used by the physician in making a determination of fitness: a. Lung ___ History of asthma or emphysema ___ Difficulty breathing ___ Previously documented lung problem. b. Heart ___ High blood pressure ___ Artery diseases ___ Documented heart problems. c. Other ___ Missing or arthritic fingers ___ Facial scars or facial deformities ___ Claustrophobia ___ General work limitations or restrictions for health reasons ___ Poor eyesight, or use of prescription eyeglasses or contact lenses A "yes" answer to any of the preceding questions would constitute a warning sign regarding the use of respirators. A medical opinion to confirm any of the above situations (answered "yes") should then be obtained. Anyone whose facial hair, scars or deformities prevents a proper respirator seal should not be required to use a negative pressure respirator. Reference 4 contains more detail on restrictive health conditions and medical tests. 5. Fit Testing and Checks Because everyone's face is different and every respirator manufacturer's facepiece shapes and sizes are different, not every size or model of respirator will fit a given individual. Therefore, the employer must have samples of several styles and sizes from several manufacturers available for fit testing purposes. Once a fit test has been done, a mask of the appropriate brand, style and size for that employee should be ordered and assigned exclusively to that employee. This method is especially useful in large programs where respirator usage is extensive. b. Detergents and Disinfectants If possible, detergents containing a bactericide should be used. Organic solvents should not be used, as they can deteriorate the rubber facepiece. (1) If detergents containing a bactericide are not available, a detergent may be used, followed by a disinfecting rinse. Reliable disinfectants may be made from some available household solutions. (2) Hypochlorite solution (50 ppm of chlorine) may be made by adding approximately 2 tablespoons of chlorine bleach per gallon of water. A 2-minute immersion disinfects the respirators. (3) Aqueous solution of iodine (50 ppm may be made by adding approximately 1 teaspoon of tincture of iodine per gallon of water.) Again, a 2-minute immersion is sufficient and will not damage the rubber and plastic in the respirator facepieces. Check with the manufacturer to find out the proper temperature for the solutions. c. If the respirators are washed by hand, a separate disinfecting rinse may be provided. If a washing machine is used, the disinfectant must be added to the rinse cycle, and the amount of water in the machine at that time will have to be measured to determine the correct amount of disinfectant to be added. Manufacturers may be consulted for additional cleaning and disinfecting instructions. d. Rinsing The cleaned and disinfected respirators should be rinsed thoroughly in clean water (120 F maximum) to remove all traces of detergent, cleaner, sanitizer, and disinfectant. This is very important to prevent dermatitis. e. Drying The respirators may be allowed to dry by themselves on a clean surface. They also may be hung from a horizontal wire, Like drying clothes, but care must be taken not to damage the facepieces. 7. Storage All the care that has gone into cleaning and maintenance of a respirator can be negated by improper storage. Respiratory protective equipment must be stored so as to protect it from dust, sunlight, heat, extreme cold, excessive moisture, and damaging chemicals. Leaving a respirator unprotected, as on a workbench or in a tool cabinet or tool box among heavy wrenches, can lead to damage of the working parts or permanent distortion of the facepiece, thus making it ineffective. After cleaning and disinfecting the respirators, they should be placed individually in heat-sealed or resealable plastic bags until reissue. They should be stored in a single layer with the facepiece and exhalation valve in a more or less normal position to prevent the rubber or plastic from taking a permanent distorted "set". 8. Inspection and Repair a. When to Inspect All respiratory protective equipment must be inspected: (1) Before and after each use; and (2) During cleaning b. Need for Inspection and Repair Continued usage of respiratory protective equipment may require periodic repair or replacement of component parts of the equipment. Such repairs and parts replacement must be done by a qualified individual(s). Replacement of parts and repair of air-purifying respirators should, in most cases, present little problem. Most, if not all, equipment manufacturers supply literature which detail the component parts of their respirator and also include servicing information. The manufacturer will also provide replacement parts. Replacement parts for respiratory protective equipment must be those of the manufacturer of the equipment. Substitution of parts from a different brand or type of respirator will invalidate the approval of the respirator. (3) distortion (allow facepiece to "sit" - free from any constraints and see if distortion disappears; if not, obtain new facepiece); and (4) cracked, scratched or loose fitting lenses (contact respirator manufacturer to see if replacement is possible; otherwise, obtain new facepiece). (b) Headstraps - check for: (1) breaks or tears (replace headstraps); (2) loss of elasticity (replace headstraps); (3) broken or malfunctioning buckles or attachments (obtain new buckles); and (4) excessively worn serrations on the head harness which might allow the facepiece to slip (replace headstrap). (4) worn threads - both filter threads and facepiece threads (replace filter or facepiece, whichever is applicable); (5) cracks or dents in filter housing (replace filter)-. (6) deterioration of gas mask canister harness (replace harness); and (7) End of service life indicator, or end of service for expiration, (contact manufacturer to find out if your filter element has one; if not, ask what will indicate the "end of service"). (e) Corrugated breathing tube (gas mask) - check for: (1) cracks or holes (replace tube); (2) missing or loose hose clamps (obtain new clamps. ); and (3) broken or missing end connectors (obtain new connectors). OSHA 1910.134 and Sec. 3.5.9 of ANSI Z88. 2 state that respirator program effectiveness shall be inspected and evaluated regularly. Periodic monitoring is necessary to ensure that workers are adequately protected. The program should be evaluated at least annually, and the written operating procedures should be modified to reflect the evaluation results if necessary. Frequent inspection of respirator use will determine whether the correct respirators are being used and worn properly. Examination of respirators in use and in storage will indicate how well they are maintained. Wearers should be consulted periodically about their acceptance of respirators, including discomfort, resistance to breathing, fatigue, interference with vision and communication, restriction of movement, interference with job performance and their confidence in the respirator's effectiveness. The results of periodic inspections of respirator use, consultations with wearers, measurements of exposure levels in work areas, and medical surveillance of wearers should be reviewed, studied, and analyzed to determine the effectiveness of the respirator program. Evidence of excessive exposure to hazards should be followed up to determine why inadequate protection was provided, and action should be taken to remedy the problem. The results of the program evaluation should be presented Ln a written report that should list plans to correct faults and the target dames for their implementation. 10. Employee Training a. Training Format When planning the training session, remember that trainees usually retain only about 20 percent of what they hear, about 40 percent of what they see, and about 70 percent of what they both see and hear. For best results, therefore, a program of lectures, supplemented by audiovisual materials and demonstrations, is recommended. Some suggestions are presented in the following text. (1) Cover the material presented in the outline. (2) Break the lecture at 30-45 minute intervals to allow the trainee to stand up and move around. (3) Use blackboard, chart pad, or flip chart for emphasizing subject sequence and major points. (4) Obtain slides and/or films from the National Safety Council, your trade association, or the manufacturer/supplier of the equipment you use and intersperse in the presentation, as appropriate. (5) Illustrate points with personal experiences or examples related to your operations. (6) Have samples of the respirators used in your facility available in the classroom. (7) Supplement the material in this appendix by covering company operating procedures and/or instructional material supplied by the equipment manufacturer/supplier. b. Content of Training Training should include the following topics: (1) The importance of correct respirator selection and use. (a) The health effects (acute and chronic) of all contaminants to which employees are exposed. (b) The consequences of improper use. (2) Limitations of respirators (a) Fit may vary with strap tightness, facial hair, body motion, etc. (b) Protectiveness may decrease if respirators become worn or misshapen or contaminated. (c) They are often hot and uncomfortable and require motivation to wear. (d) Allow skin and in some cases eye exposure. (e) May not be capable of protecting against all contaminants, or high levels of contaminants. (3) Rationale for respirator selection you have made. (4) Proper use (include hands-on demonstration). (5) Daily positive and negative pressure fit checks. (6) Qualitative and/or quantitative fit testing - why it is necessary. (Cover even those aspects which employees do not have to do, so they can judge if their respirators have been properly treated. (8) Proper storage. References 1. Respiratory Protection, An Employer's Manual, NIOSH publication 78-193A. 92 pages, order from National Technical Information Service, 5285 Port Royal Road, Springfield, VA 22161, # PB 80-184-401, $11.95. 2. 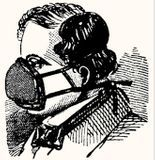 A Guide to Industrial Respiratory Protection, NIOSH Publication 76-189. 180 pages, Order from National Technical Information Service, 5285 Port Royal Road, Springfield, VA 22161, #LA-667-lM, $16.95. 3. OSHA General Industry Standards, 29CFR 1910, OSHA Publication, 1984.